thandai is a traditional cooling drink, popular in the northern parts of india. thandai is made with a mix of dry fruits, seeds and a few spices. in a bowl, pour 1 cup warm water. then add almonds, pistachios, poppy seeds (khus khus), melon seeds, dried rose petals, 1 tablespoon fennel seeds and ½ teaspoon black pepper. mix very well. cover and keep aside for minimum one hour or 2 hours. if you use water at room temperature, then you can also keep overnight or for 4 to 5 hours. after 1 to 2 hours, pour the whole mixture including the soaking water in a grinder or blender jar. do make sure to use a good grinder or blender. add ½ cup sugar, seeds from 3 to 4 green cardamoms and 1 pinch of saffron. blend the mixture to a very smooth and fine paste. remove in a bowl and keep aside. you can cover and refrigerate if not using immediately. to prepare thandai, take about 4 tablespoons of the thandai paste in a glass. add chilled milk. you can also use half-half combination of milk and water. add a few ice cubes. garnish with rose petals. you can also garnish thandai with some chopped almonds or pistachios. serve thandai immediately. alternatively, you can prepare the thandai drink in a large mug or jug. refrigerate and then serve. if using gulkand, then reduce the sugar to ⅓ cup. grind the paste very finely, especially if preparing for kids. you can even strain the thandai paste if you want. you can use peeled almonds if you want. just blanch the almonds separately and then peel them. 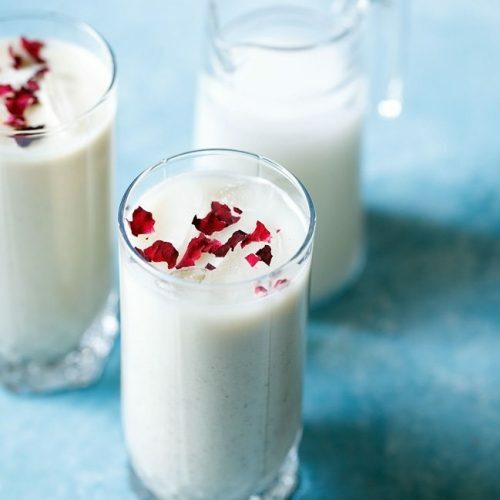 instead of milk, vegans can use almond milk to make thandai. the thandai paste keeps well for about a week. skip poppy seeds if its not available in your country.